Artist: AUDREY KAWASAKI. GICLEE Print. Markings: Signed & Numbered by the artist. Condition: Mint. Artist: AUDREY KAWASAKI. Title: "TWO SISTERS". GICLEE Print. Markings: Signed & Numbered by the artist. Condition: Mint. Audrey Kawasaki "En Chantée". Hand signed by Audrey Kawasaki. Giclée print on Moab Entrada 290gsm Cotton Rag. Title: "HYAKKI YAKOU". Artist: AUDREY KAWASAKI. GICLEE Print. Markings: Signed & Numbered by the artist. Condition: Mint. MINT CONDITION - Audrey Kawasaki's piece titled "CHARLOTTA". It is signed and numbered out of a limited edition of only 200 pieces. Mint condition, never taken out of the original tube. Original giclee print on 100% cotton archival fine art paper. Markings: Signed & Numbered by the artist on the image area. Limited Edition Print of 100. Audrey Kawasaki - She Who Dares. Edition Details. Technique: Giclee. Released: 11/16/08. "RECONCILE". AUDREY KAWASAKI. This print was sold at Audrey's show entitled "The Drawing Room" at ThinkSpace Gallery in Los Angeles in 2009. Giclee Print. Markings: Signed & editioned by the artist. Condition: Mint. A rare opportunity to acquire one of the artists early works, ready to hang. Handsigned and numbered small edition of 150. Edition of 150. Title: "LACEY". Artist: AUDREY KAWASAKI. GICLEE Print. Markings: Signed & Numbered by the artist. Condition: Mint. This is Audrey Kawasaki's piece titled "When It Begins" (2014). This one is a rare Artist Proof and is signed and numbered out of a limited edition of only 10 pieces and in NM /Mint condition. Brian Viveros. Edition of 75. New ListingAudrey Kawasaki "SHE WILL" (2018). Signed, Numbered, Matted, Framed. AUDREY KAWASAKI: "SHE WILL" (2018). Signed & numbered by the artist. Numbered 529 of an edition of 1050. Acid-free, custom mat. Image Size: 15 1/2 x 19 1/2. Giclee Print. Up for sale is a mint "Charlotta" giclee art print by Audrey Kawasaki released in 2017. Edition of 200 Signed and Numbered prints. "FRAGILE"by Audrey Kawasaki, released in 20 16. Giclee print on 10.5" x 21” (27.6 x 53cm) archival 100% cotton paper. Perfect condition. AUDREY KAWASAKI. Audrey Kawasaki is a Los Angeles based artist who studied fine art at Brooklyn's Pratt Institute. Audrey's precise technical style is at once influenced by both manga comics and Art Nouveau. Up for sale is a 2013 giclee print by Audrey Kawasaki titledThings Unsaid. Don't miss your chance at this print before it's too late. The print will be securely wrapped in kraft paper before it is placed in the tube (for extra protection). 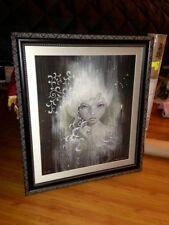 AUDREY KAWASAKI - 'THINGS UNSAID' SIGNED GICLEE PRINT . Title: Things Unsaid. Signed & Numbered?. Yes, Audrey Kawasaki, in an edition of 200. This is an official art-print released and sold by Audrey Kawasaki. "HI KITTY"by Audrey Kawasaki, released by the artist in 20 14. Giclee print on 17.75" x 12.5” (45 x 32cm) white art paper. Perfect condition. Art print by Audrey Kawasaki. This item was originally released May 2009 at her solo exhibition in Japan. (Space Yui Gallery) But they are not taking any overseas orders so It's really hard to find to get. Limited Edition Signed/Numbered by Artist. AUDREY KAWASAKI - 'AS I FALL' SIGNED GICLEE PRINT . Signed & Numbered?. Yes, Audrey Kawasaki, in an edition of 1460. This is an official art-print released and sold by Audrey Kawasaki, through her official website. The following listing is for an authentic, hand-signed, hand-numbered, limited-edition She Will art print by Audrey Kawasaki. It is a hand-signed, hand-numbered edition of a mere 1,050 and it measures approximately 16”x20". It is on-hand, in mint condition, and will ship immediately upon payment. Audrey Kawasaki "TWO SISTERS (2008)." Signed, Numbered, Matted, Framed. AUDREY KAWASAKI: "TWO SISTERS" (2008). Signed & numbered by the artist. Acid-free mat, archival backboard, mounted with archival mask. Audrey Kawasaki "OFFERING (2013)." Signed, Numbered, Matted, Framed. Signed & numbered by the artist. Numbered 349 of an edition of 400. Acid-free mat, floating mount with archival mask. Up for sale is a 2008 giclee fine art print by Audrey Kawasaki titledUria. This rare printis signed, and numbered by Audrey Kawasaki in pencil out of an edition of just 200 and is now sold out. Audrey Kawasaki "THINGS UNSAID (2013)." Signed, Numbered, Matted, Framed. AUDREY KAWASAKI: "THINGS UNSAID" (2013). Signed & numbered by the artist. Acid-free mat, floating mount with archival mask. Up for sale is a 2011 giclee print by Audrey Kawasaki titledEnrapture. Don't miss your chance at this print before it's too late. The print will be securely wrapped in kraft paper before it is placed in the tube (for extra protection). Audrey Kawasaki "KEEPER (2013)." Signed, Numbered, Matted, Framed. AUDREY KAWASAKI: "KEEPER" (2013). Signed & numbered by the artist. Numbered 43 of a VERY LOW edition of 200. Acid-free mat, floating mount with archival mask. Audrey Kawasaki "HYAKKI YAKOU (2009)." Signed, Numbered, Matted, Framed. AUDREY KAWASAKI: "HYAKKI YAKOU" (2009). Signed & numbered by the artist. Numbered 933 of an edition of 1150. Acid-free mat, floating mount with archival mask. Audrey Kawasaki "NEGAIGOTO (2010)." Signed, Numbered, Matted, Framed. AUDREY KAWASAKI: "NEGAIGOTO" (2010). One of the lowest editions of any Audrey giclee piece - very rare. Signed & numbered by the artist. Acid-free mat, floating mount with archival mask. This is Audrey Kawasaki's piece titled "Charlotta" (2017). It is signed and numbered out of a limited edition of only 200 pieces. This one is a low #16/200 and in NM /Mint condition. Audrey Kawasaki "KAZAMACHI (Waiting) (2009)." Signed, Numbered, Matted, Framed. AUDREY KAWASAKI: "KAZAMACHI (WAITING)" (2009). Signed & numbered by the artist. Numbered 66 of an edition of 150. Acid-free mat, floating mount with archival mask. Up for sale is a 20 16 giclee art print by Joanne Nam titledLucid. Don't miss your chance at this print before it's too late. Audrey Kawasaki "WHERE I REST (2011)." Signed, Matted, Framed. Acid-free mat, archival backboard, mounted with archival tape. AUDREY KAWASAKI: "WHERE I REST" (2011). Signed & numbered by the artist. I am not a dealer, just a collector preparing for a move.with the need to downsize the collection a bit. It is signed and numbered out of a limited edition of only 1460 pieces in the lower right of the image. This is Audrey Kawasaki's piece titled "As I Fall" (2016). Up for sale is a 2014 giclee print by Audrey Kawasaki titledManic. Don't miss your chance at this print before it's too late. The print will be securely wrapped in kraft paper before it is placed in the tube (for extra protection). This is Audrey Kawasaki's piece titled "She Will" (2018). It is signed and numbered out of a limited edition of only 1050 pieces and in NM /Mint condition. 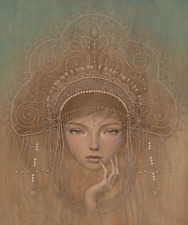 Audrey Kawasaki "Ephemera" art catalog MINT showcases early works! The catalog is 9" x 12" and contains a few full page Audrey Kawasaki images, including "Charlotte" as seen on the cover. Audrey Kawasaki "RECONCILE (2009)." Signed, Numbered, Matted, Framed. AUDREY KAWASAKI: "RECONCILE" (2008). Originally sold at Audrey's show "The Drawing Room" at ThinkSpace Gallery in Los Angeles. Acid-free mat, floating mount with archival mask. Signed & numbered by the artist. Audrey Kawasaki "CHARLOTTE (2011)." Signed, Numbered, Matted, Framed. AUDREY KAWASAKI: "CHARLOTTE" (2011). Signed & numbered by the artist. Acid-free mat, floating mount with archival mask. This is a relatively large print in a small edition for Amy Sol and (imho) one of her best prints to date ! It is signed and numbered out of a limited edition of only 1160 pieces. This one is #1104/1160 and in NM /Mint condition. This is Audrey Kawasaki's piece titled "Charlotte" (2011). This is Audrey Kawasaki's piece titled "Keeper" (2013). This piece is a very nice 18 x18" Giclee Fine Art Print that was released exclusively at the 2013 San Diego Comic-Con. It is signed and numbered out of a very limited edition of only 200 pieces. This is Audrey Kawasaki's piece titled "FRAGILE" (2016). This art print is signed and numbered out of a limited edition of only 150 pieces. This particular one is S/# 98/150 and in NM /Mint condition.